Internal Bluetooth remains a build-to-order option. Apple also switched from the Radeon 9200 graphics processor to the Radeon 9600 and increased video memory from 32 MB to 64 MB. The SuperDrive on the 2005 eMac burns DVDs at 8x, the same speed as last year’s model, but the new SuperDrive also burns dual-layer DVDs. 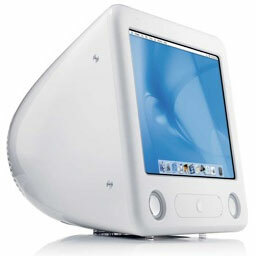 The 2005 eMac ships with Mac OS X 10.4 Tiger. Although it dimensions match the original iMac, the eMac is heavy- 50 pounds vs. 35-38 for the 15″ iMacs. Got an iMac or an eMac? Join our iMac & eMac Group or iMacs & eMacs Forum. Introduced 2005.05.03 at US$799 (Combo) and $999 (SuperDrive). Special 1.25 GHz education version available. discontinued 2005.10.12, except for education sales, with introduction of iMac G5/1.9-2.1 GHz. Combo drive reads DVDs at up to 12x speed, writes CD-R discs at up to 32x, writes CD-RW discs at up to 10x, reads CDs at up to 32x. SuperDrive writes DVD±R discs at up to 8x speed, DVD±RW at up to 4x, reads DVDs at up to 10x, writes CD-R discs at up to 24x, writes CD-RW discs at up to 10x, reads CDs at up to 32x. Oh, just go get yourself an eMac and call it a night, Bill Palmer, BillPalmer.net, 2004.07.02. The flat panel iMac is dead. Long live the eMac!